Great, comprehensive modulation; all-in-one modulation and delay solution; mind-boggling range of effects; easy-to-use interface. Anyone on at least nodding terms with music production knows that a sprinkling of delay and modulation throughout the average mix is an essential life-giving element. Standard delays are ten a penny these days, but deeper, more versatile modulation plug-ins seem to be a bit thin on the ground. 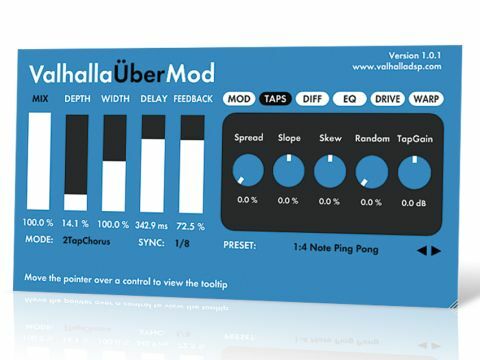 ValhallaDSP aims to meaningfully up the numbers with its latest offering, ÜberMod. "The Diffuse effect is surprisingly flexible, pushing the delays back into the mix with gentle ambience, or submerging them in cavernous reverberation. " At ÜberMod's core is a set of global Chorus Modes that determines the overall character of the effect, setting the number of delay taps and the shapes of the modulation waveforms. There are nine in all, including 2TapChorus (an emulation of the Roland Dimension C and Dimension D choruses), SuperSix (a six-tap modulation with a detuning algorithm, modelled on the Roland JP-8000) and 16Tap (superb for rich ensemble effects). For transforming presets or creating new patches from scratch, the Mode setting is a good place to start. On the right-hand side of the interface is a series of tabbed pages containing the main sound-shaping controls. The Mod page details the two LFOs that control the modulation of the plug-in. The Slow LFO is used for gentle, mellow detuning, while the Vibrato LFO is much faster, for delivering thicker, ensemble-type modulation. The Taps section handles the delay lines, and it's here that the plug-in really roars into life. Control is given over everything from tap Spread to amplitude Slope and panning Skew - this certainly isn't your bog standard multi-tap delay, and it's capable of generating everything from silky, organic flanging to scattergun explosions. The Diffuse and EQ sections add final glitz to the output. The Diffuse effect is surprisingly flexible, pushing the delays back into the mix with gentle ambience, or submerging them in cavernous reverberation. The EQ section features Bright and Dark tonal Modes, Low (10-2000Hz) and High (100-20,000Hz) Cut filters, and the very cool SpatialEQ setting, which defines the frequencies that get affected by the Width parameter. This enables the upper mids and highs to be fanned out to the sides while keeping the lows in the centre, for example. The last two sections are Drive and Warp. While overdrive isn't exactly a groundbreaking feature, there's nothing quite like gently saturating a delay for adding crispness and separation from the dry signal. For extra grunge, the Noise control mixes in white noise - helpful for that lo-fi, tape delay sound. Finally, the Warp section facilitates half-speed delay playback, control over the feedback mix and parameter change Smoothing. The main group of sliders on the left side of the interface give the user high-level control over the plug-in, setting boundaries and global context for the tabbed right-hand control section. The Depth, Width, Feedback and Delay settings control the strength of the effect, with the mode-specific parameters on the right being used for fine tuning and in-depth sound shaping. Essentially, once you've set the ranges of the parameters with the main sliders, the rotaries in the right-hand section operate within them. For example, if you set the Delay to 500ms on the left and the Taps Spread to 25% on the right, the delay times of the taps will range from 125ms to 500ms. It's a very effective layout/system, enabling you to, say, thicken up the overall sound by simply cranking up the Depth slider rather than having to needle your way through numerous related dials in the right-hand section. The overall theme with ÜberMod is flexibility; it's fully adept at delay (both 'digital' and tape-style), flanging, chorus, reverb (of the 'unreal' type), pitchshifting and everything else that modulation makes possible. The sound is simply gorgeous, and the plug-in boasts power and ease of use in equal measure, the latter helped no end by the descriptive tooltips that appear over each control. We would nonetheless like to see a manual added sooner rather than later. ÜberMod is one of those plug-ins that you'll find yourself reaching for time and time again. It's a daily go-to for 'standard' chorus, delay and suchlike, and a powerhouse when it comes to special effects and sonic mayhem.